Have you ever watched the needle play, may be, when you were young and your granny or your mom used to embroider table cloths or patterns to your attires? Have you seen the beauty of how the needle chases its way through the fabric and weaves a pattern that speaks of warmth and permanence? It’s satisfying, isn’t it? Even if the process is long drawn and requires patience, the end result is totally worth the wait. Embroidery never really went out of fashion and neither can it ever go. You know why? Because hand and machine embroidery are both intricate and have the capability of enhancing the beauty of a plain white sheet as well. Glance through housekeeping and lifestyle magazines and you would find scores of pictures of unique embroidery designs. Bespoke embroidery enhances simple as well as fashionable clothes with the element of detailing and precision. Not just at homes, brands too, use custom embroidery designs for corporate and promotional items, for example, monogramming for special occasions. Look around and you’ll see embroidery nearly everywhere— embroidered sheets, coats and jackets, denims, bags and shoes, blouses and shirts, and what not! When you are bored with a regular pair of jeans, just spice them up with some custom embroidery and you’ll have yourself a brand new outfit. Embroidery presents a variety of options to enhance home décor as well, for example, you can infuse new life into your old bed cover with an embroidered patch or use fabric dyeing with custom embroidery for your old table cloth or curtain and make them brand new. But since the present lifestyle is so busy, you might not have the time to craft for yourself the embroidery that you’ve imagined, and that is where we can help you. The apparel industry uses new threads and patches as well as unique patterns and placements to make your embroidery stand out. Fashion designers and models are going gaga over embroidered outfits. 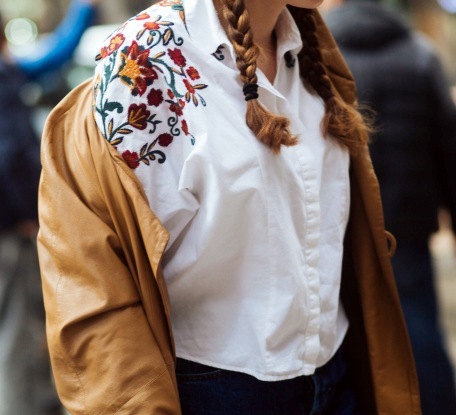 From stitched floral patterns to bold patches, embroidery is paving its way all the more to the ramp now. So shouldn’t it pave the way to your closet as well? Reach out to us to grab your custom embroidered outfits and home décor items, or to fulfill your corporate embroidery needs. Let’s don the vintage technique of embroidery with a zing of the modern. Do you like embroidered patterns? What kind of embroidery do you prefer— bold or delicate? What is your style statement? Share your thoughts below.